A few of my hobbies: reading, making documents in Microsoft Word, eating cookie dough, running (to offset the cookie dough), planning for Halloween, and sifting through vintage stores. In the past three days, I think I've pretty much hit on all of those hobbies. Hooray! My recent foray into the nearby vintage store led me to some fun old postcards. There's one from Guatemala that I plan to send to my friend Amy because we traveled there together, and one that will go to Matt for the same reason (but it's of Carlsbad Caverns). 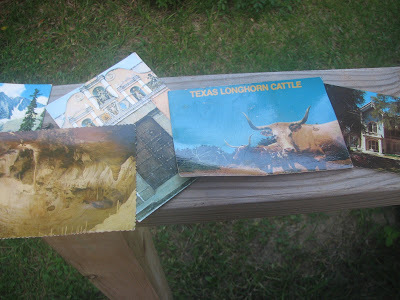 Then there's the Texas Longhorn Cattle just because I live in Texas now and I may need to send the unexpected postcard. I purposefully bought ones that haven't yet been written on, so I could really use them. It gave me the idea that vintage postcards would make great Save the Dates (my friend, Camella, also used them for her RSVP cards). You could just print your message on clear labels or colored sticker paper that can be cut into labels. I tried to do a quick search for others who had gone this route, but all I could find was this fake vintage postcard. Like your friend, we decided to do this for our RSVPs. Part of the draw of that is that you can display them during the reception en masse. I highly recommend using vintage post cards for either, though. They're super inexpensive; it's recycling; and it was one of the wedding prep projects that both of us really enjoyed (sifting through boxes of them in antique stores, that is) and could do together. 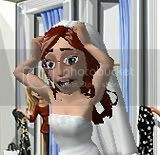 PS--I love your blog! Great ideas! Just an FYI: Someone HAS finally done it!